It has long been known that consumers use their tablets to research purchases. 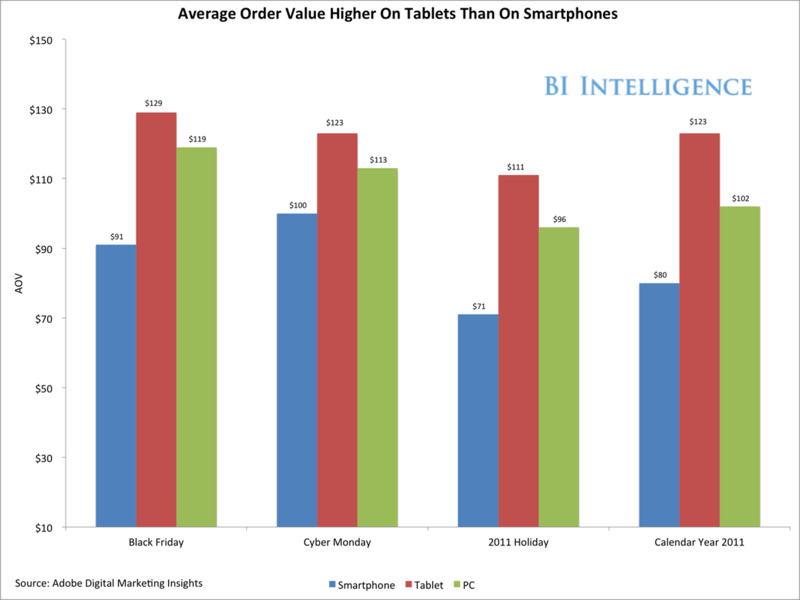 But tablets are also used to complete purchases, much more so than smartphones. In a recent report from BI Intelligence, we examine the rise of the tablet consumer, look at the size of the mobile commerce opportunity in dollar terms, and analyse how some of the top mobile commerce trends – including mobile payments, tablet commerce, and SoLoMo (social-local-mobile) marketing – are contributing to a big increase in mobile commerce. Mobile commerce is big, and getting bigger: 29% of U.S. mobile users already have used their smartphones to make a purchase. Bank of America predicts $67.1 billion in revenue from smartphone and tablet retail purchasing by European and U.S. shoppers in 2015. But tablets are also used to complete purchases: Traffic from tablet visitors to retail websites quadrupled during 2011. Tablets now drive more traffic to online retailers than smartphones, accounting for 7% of traffic to ecommerce sites (vs. 5% for smartphones). And tablet consumers also spend more money: In 2011, tablet consumers spent 50 per cent more per order on retail websites than smartphone shoppers — and more unexpectedly, 20 per cent more than shoppers on PCs. Tablet device sales will fuel additional growth in the coming years: With lower prices, more device options, and emerging market opportunities, tablet sales are set to explode to 450 million annually by 2016. Increased tablet commerce volume will likely come along with it.